Goodbye San Francisco, I love you but I had to go. I learned that word recently: "wanderlust". This is what I feel, this is why I left. To loose myself, and we'll see what's left. I'm in Paris now for the next couple of weeks. After 2 years in San Francisco, I forgot how big this city is. People, people, people everywhere. Walking around, talking aloud, running past you. The familiar streets bring back childhood memories. But something has changed now: me. I've seen another sky, I've breathed another air, and now I feel estranged from the city I once called home. My friends and my family are still here, and it's great to see them again. Catch up with everybody before leaving again. Time flies, and so will I, to Cape Verde on May 15th. I originally planned to sail to Cape Verde from the Canaries, but it was impractical: I have to fly back to San Francisco in August for Burning Man. No time to be a boat hitchhiker. The other worlds! The worlds within ourselves, our imagination, our subconscious. That's what I'd like to explore, and that's what my game is all about. As you may know, I'm working on a still unnamed indie game project. It's about a girl, Emily, who finds a tunnel in the New York subway that takes her to a strange tropical island. As she explores the island, she starts to realize that this place is actually her own consciousness. I've been working full-time on this game for the past few weeks, and I'm super excited with what I have so far. Not that I have much, mind you, but the tiniest thing makes me happy. After working on the sea and the trees back in March, I finally did my first piece of land! 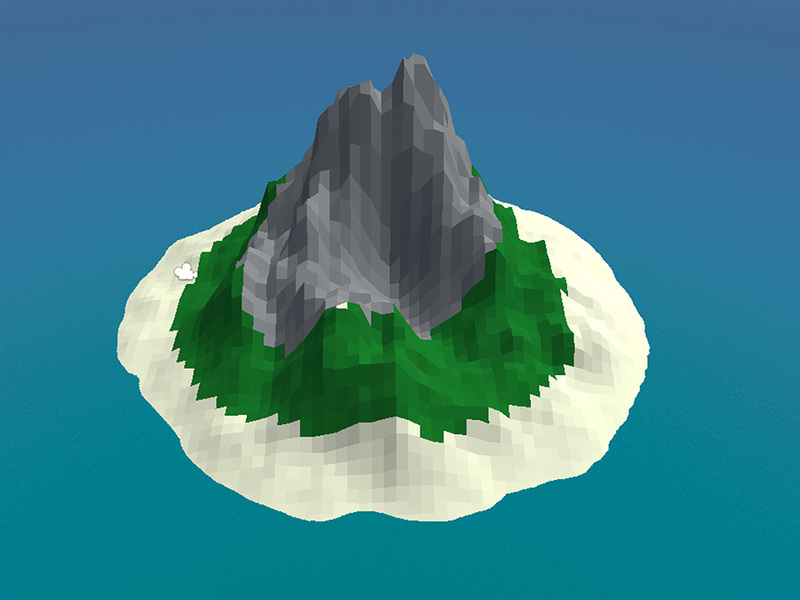 I made a tiny island, approximately 50 meters in diameter with a 20 meters high rocky peak at its center. 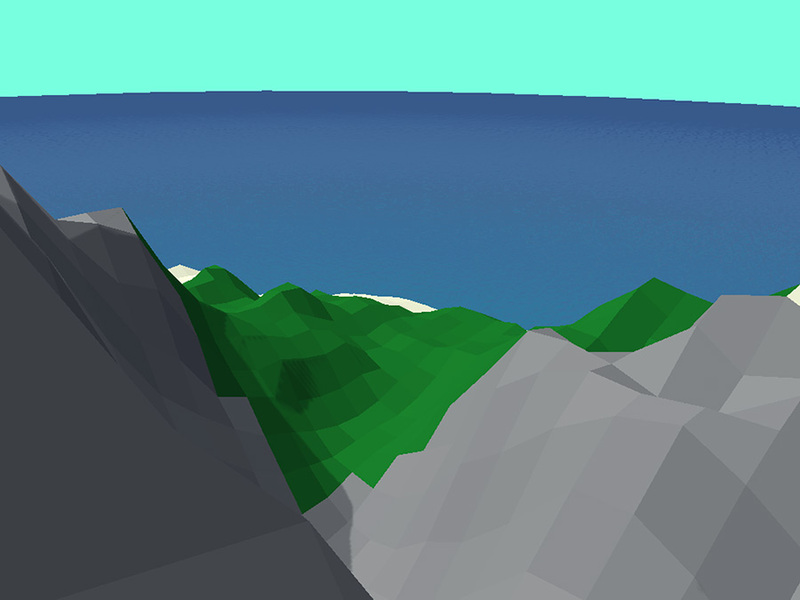 The island sports that characteristic low-polygon style that I'll use throughout the game. You can't do anything on the island yet, but I caught myself having quite a bit of fun just trying to find a path to the summit. I've been able to get pretty far high, but I always hit a point where it's too steep to walk and there aren't enough rocks to jump on. I think the summit will stay out of reach for now. Or will it? I'm sharing some screenshots below and I'll soon be sending out a web player version so that you'll be able to try it as well. The hard part was learning the tools (Blender and Unity) and finding the right techniques. A lot of time went into getting that low-polygon look right. Graphics card have this tendency to smooth out any polygon they can get their hands on, and having everything look flat was surprisingly hard. Next steps: improve the ocean, add some trees, a couple of clouds and the sun. Reminds me of Jimi Hendrix: "Pick up the pieces, make an island. Might even raise a little sand [...] 'cause I'm a voodoo child..." Oh yeah! Much voodoo indeed. Do you know anyone in Cape Verde that could rent me an apartment? English poetry! I need to read good English poetry. If there's a poem or a poet you like, send me a link! More generally, I need to improve my writing skills in English and my vocabulary. Any suggestions? I think I especially need to learn more adjectives. How could I do that? Name the game! I'm trying to come up with a good name for the game. Currently, I just refer to it as "my game", which is a bit ridiculous, or by the code name "Islands of Consciousness", which I don't really like. If you have any suggestion, please send me an email. That's all folks! That was the first installment of the development log (devlog) of my game. Expect a new one in a couple of weeks, sharing my first impressions of Cape Verde and more screenshots! Inspired by Luc Durtain, d'homme à homme. The original version, in French, reads: "Bref, le monde d’abord; puis, dans le monde, l’homme; dans l’homme, les autres hommes."